Part of my job here in Spain is basically chit-chat with grammatical correction. I have developed little hand cues that mean invert order of noun and adjective that are…more or less understood. One of the upsides of this is that I’ve wandered through quite a few different topics of conversation and I’m always picking up fun little bits of information. Last week one of the more offbeat topics was tropical fruit. Mariano, one of the professors I work with, is from an area of Granada called Almuñecar that has a unique climate that makes it a cornucopia of tropical fruit you cannot find in any other part of Spain. Pomegranates, peaches, custard apples, and one of his family’s favorites, the níspero or loquat. First off, I love the name of this fruit in English and Spanish. It’s fun to say. They are what I think of as tasty words; words that leave a good feeling in your mouth if you say them out loud. I now prefer loquats to kumquats just because I think it sounds prettier. Secondly, I had never seen or eaten one of these, so I tracked some down and tried them out. Tasty. Sweet, tender flesh that’s a mix between the flesh of a peach and an apricot, with the skin in between peach and citrus fruit, and a flavor all of its own. Sweet, but not cloying. And never fear, americanos mios, because my sister-in-law says she saw them in Whole Foods. You too can enjoy exoticism in a family-friendly way. Because I am who I am, as soon as I had tried one, I started thinking. Yes, I could make a pie. But for a change in pace, I decided that they would make an awesome upside-down cake. It would be a challenge, but I was up to it. Let’s do it. I started hunting around in the internet and found a recipe for this peach cake. Truthfully I wanted to make a basic yellow cake, but I only had two eggs and the recipe called for three. Oh well. 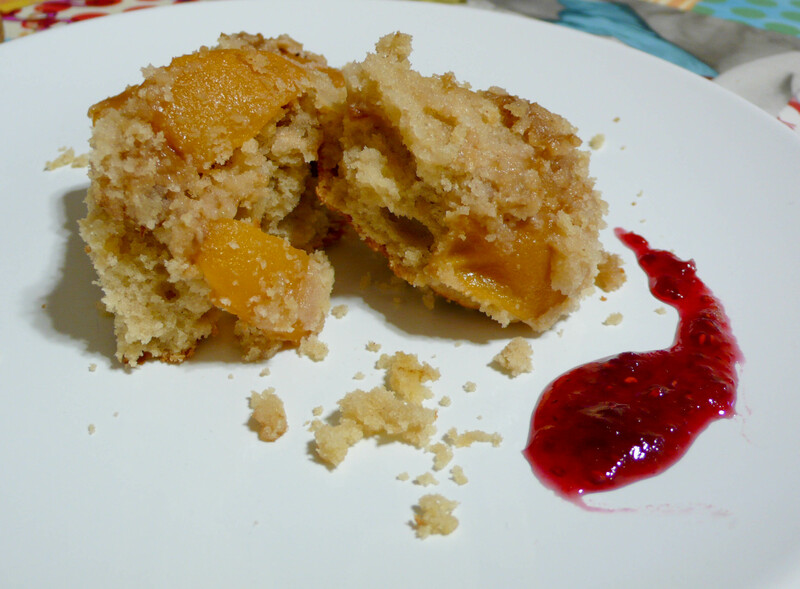 At the end, the texture turned out to be like a mix between cobbler topping and a cake, of a really awesome coffee cake. I doubled the recipe because the cake pan was way too large, fudged oven cooking times off or a recipe for pineapple upside down cake and messed around with the instructions a little to get the effect I wanted. 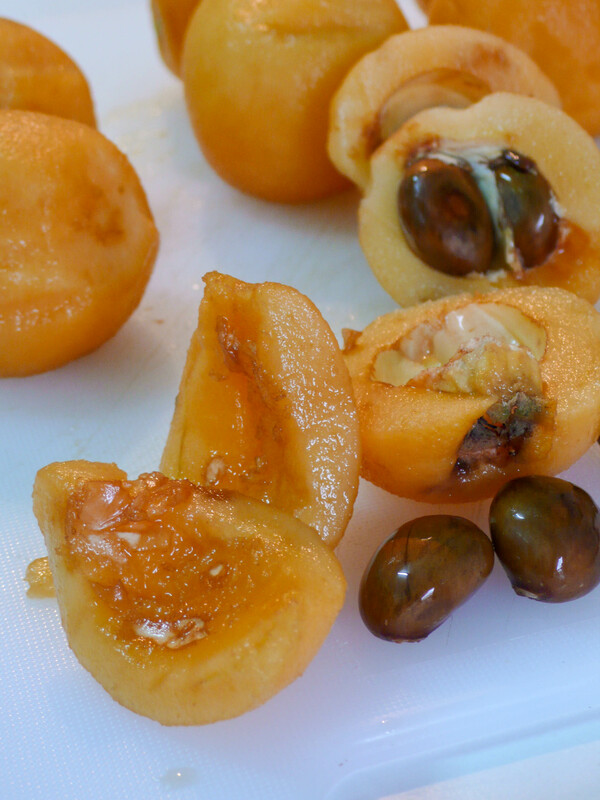 Part one: how to process the loquat. 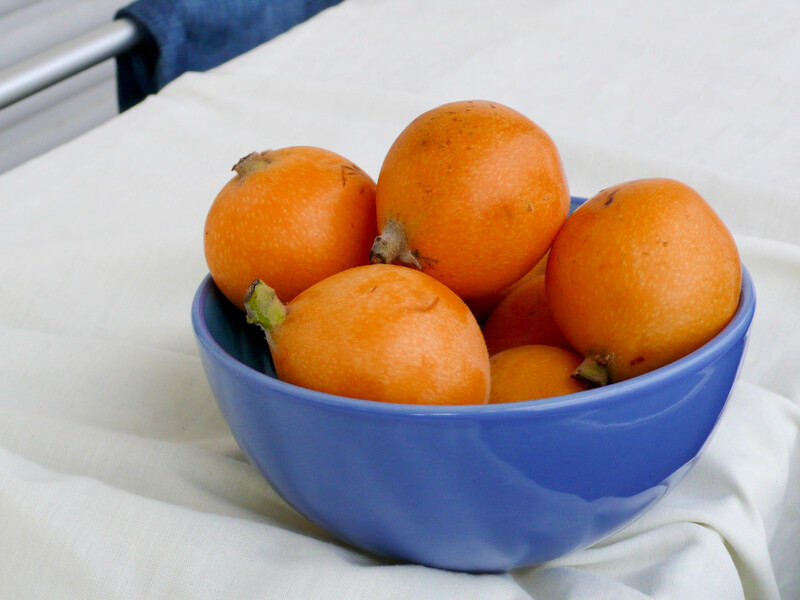 First, peel the loquats. I did it with a paring knife, cutting off the stem and pulling down. There’s no need to blanch them like a peach or tomato – the skin peels away very easily. Then, pull out the seeds – there will be three or four large, chestnut like seeds. Finally I scraped out the white pith because I didn’t want any lingering bitterness. You can eat it no problem, I just didn’t know how it would cook up. To make it easier to scrape out, I quartered the loquat. Preheat the oven to 350 F, 175 C.
In a sauce pan, make the caramel sauce. 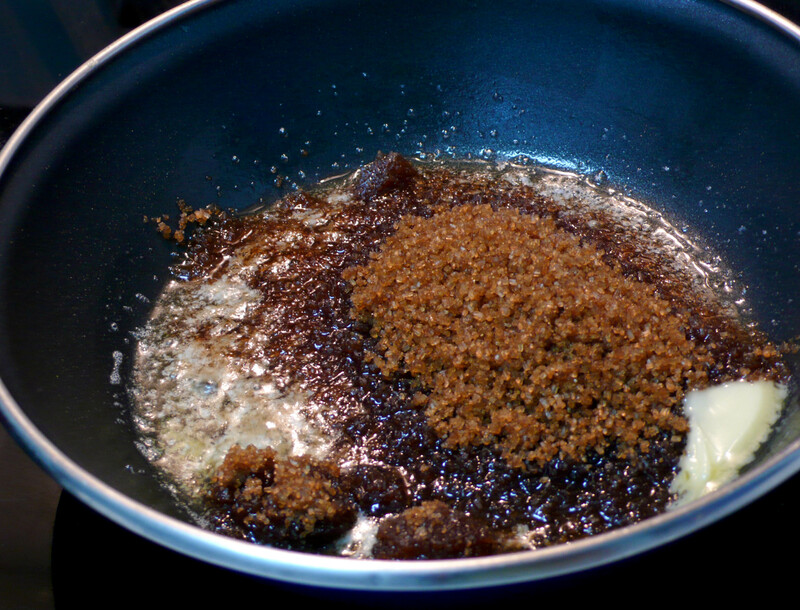 Melt the butter and dissolve the brown sugar. When it starts to boil, add the milk, stir vigorously, then remove from heat. It’s not too much caramel – just enough to add flavor, not go oozing all over when the cake is done. 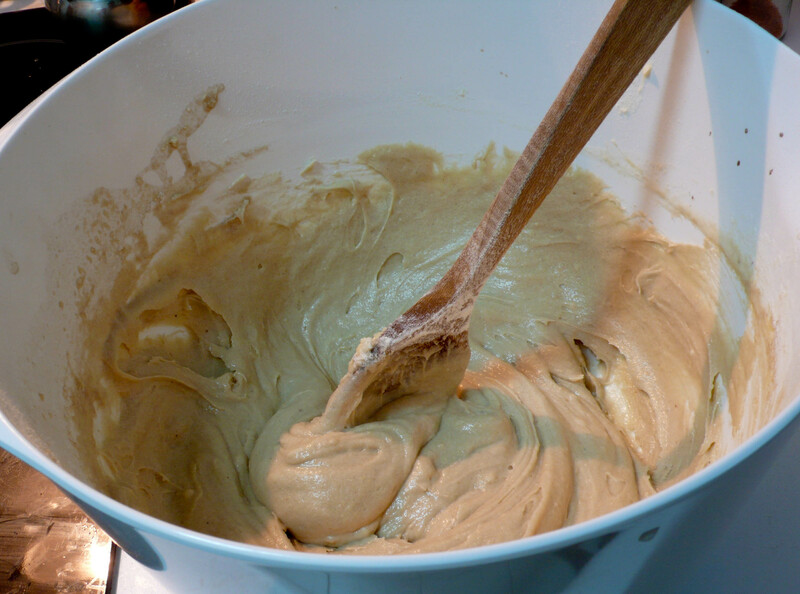 In a separate bowl, mix the flour with the salt, spices, and baking powder. Set aside. Cream butter and white sugar, then beat in the eggs and vanilla. Add in the flour little by little, alternating with the milk. The mix will be rather wet. 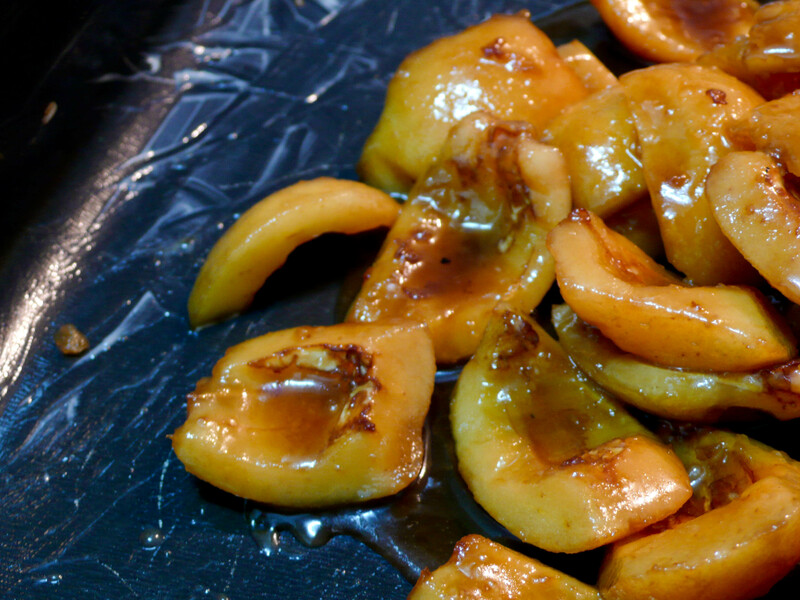 Mix the loquats with the caramel sauce and spread over the bottom of the pan. Drop the cake batter in dollops over the fruit and spread it gently. Try to seal off edges to keep the caramel in its place at the bottom, where it belongs. 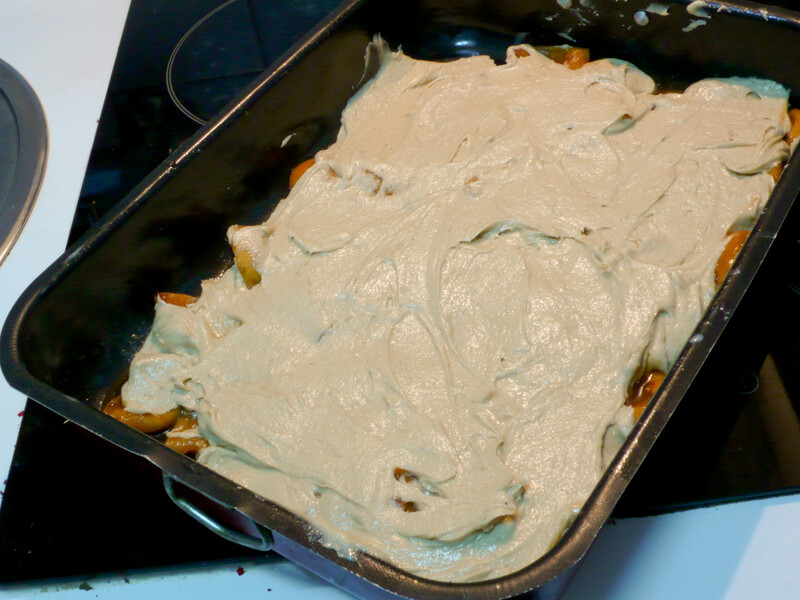 As you can see, my roasting pan was waaay too large and I had gaps that let the caramel bubble up. Don’t be like me. Bake for 30 minutes, checking after 20 to see if a knife or toothpick comes out clean. Let it cool for at least an hour, then slice and invert! This cake is super moist and tasty. I would definitely make it again with loquats or peaches. Tasty. Haha thanks! Someday I’ll have cake pans. I have no clue how I’m going to make birthday cake in a few days. I may have to make it in the roasting pan and cut it in half to layer it. But I’ve watched MacGyver. I don’t have to blow anything up, just figure out how to get cake out of the oven. Hey! Thanks for reading. Actually, I said that I like saying kumquat and loquat out loud – I understand that they are different fruits. I was just riffing on their phonemes. Níspero is the Spanish word for loquat. Kumquat is quinoto or kumquat in Spanish. Hope you try out the recipe though, because it is quite tasty. I prefer using kumquats in cocktails or preserves rather than cakes.